Reason 1,000 that humans are weird: we’ve evolved to crave both pleasure and pain, aka “benign masochism.” And nothing exemplifies that feeling like deliciously painful hot sauce. 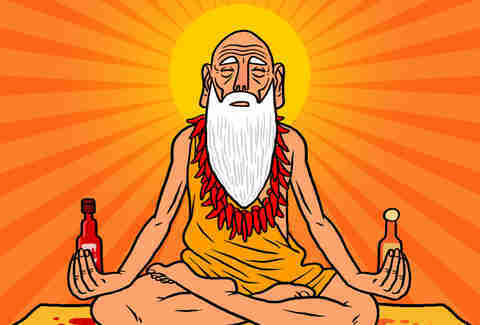 That duality of good and bad goes way beyond your fiery palette as well -- the effects of hot sauce on the human body are varied and run the gamut of the very good (increases your metabolism!) to the very unfortunate (it makes you drool like a doberman pug mix!). Now get an ice pack and peep the rest of the fiery facts on just what the heck this liquid heat is doing to you. Full disclosure: there’s going to be a whole lot of stimulating going on. But first up, the capsaicin in hot sauce tricks your mouth into believing that it’s actually hot by binding to a sensor found in taste buds on your tongue called vanilloid receptor 1. (This is the same receptor that tells your brain when you are, quite literally, on fire). Since this receptor is activated both by heat and capsaicin, and does not discriminate between the two, its stimulation makes your brain believe that the temperature is higher than it really is; that you are burning up. But you are not actually burning, and for some reason you love it. Hot sauce raises your body temperature, in a process called thermogenesis. As a result, you sweat, turn red as your capillaries dilate, and your nose runs as your mucous membranes try to flush out whatever is behind this. Remember, all of this is in response to totally imaginary heat. 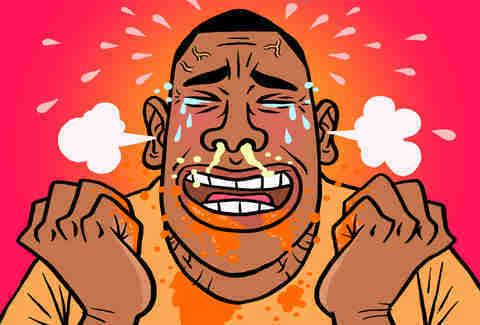 The burning sensation on your skin and mucous membranes increases saliva flow, making you swallow more. Similarly, touch your eyes and your tear ducts will go into overdrive. But know that if you want to “cool down”, ice is not the answer. Capsaicin is actually not soluble in water, it much prefers oil/fat. This is why milk or sour cream are so effective at reducing the burn. You can also consider your mouth a recently dunked iPhone and eat bread or rice to absorb the capsaicin instead. Also: quitter. Those pain receptors in your mouth can also be found in your intestinal wall, which is similarly stimulated to the point that you may experience stomach cramps and possibly the excretion of extra fluids, which might mean… do you really need us to spell it out? But don’t worry, all of this is boosting your metabolism, so grab that extra wing. 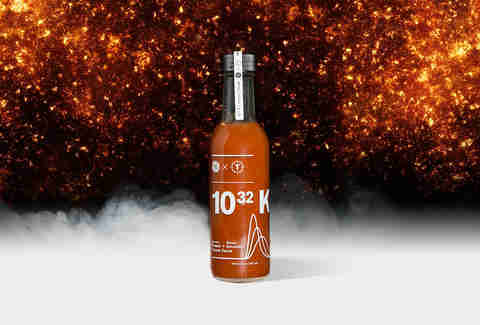 We teamed up with GE to produce a limited-edition hot sauce to celebrate the blazing work GE scientists do everyday with high temperature metals and ceramics. The sauce is made with the first- and second-hottest peppers in the world -- the Carolina Reaper and the Trinidad Moruga Scorpion. And you can get it here. Hot sauce fiends love the burn because that joy is real. Your brain responds to the fact that it believes you are on fire by releasing endorphins, similar to a runner’s high, to tell you that it’s got this, and that repairs are underway. Hot sauce acts as a general stimulant, increasingly blood flow to the stomach, elevating your heart rate, and generally adding zing to every system in your body. 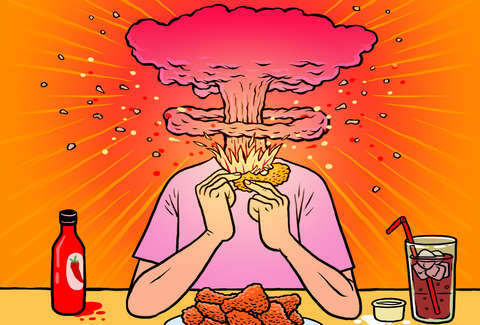 This is why Sriracha-covered wings don’t spell naptime -- you just ate the food equivalent of a run around the block. While the burn itself, however dramatic, lasts no more than 15 minutes, numerous studies show that the mega dose of vitamin C in capsaicin and perhaps, maybe, all of the above, lead to generally increased lifespans among hot sauce lovers (we’re talking dousing your food in hot sauce four times a week). 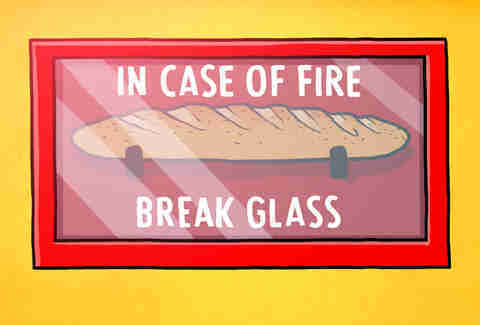 Which is all to say… pass that bottle of mouth magma.